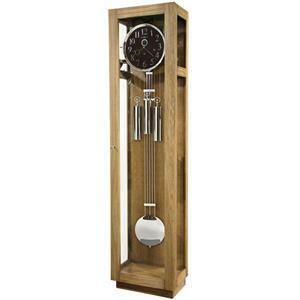 You can have a classic and timeless accent for your home with this grandfather clock. 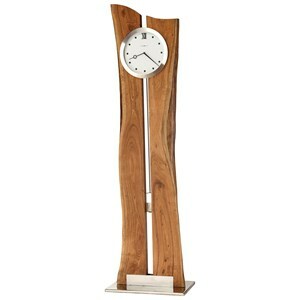 The clock features a rich Espresso finish on select hardwoods and veneers. A modern, flat top features simple but elegant lines while the platform base elevates the clock off the floor. A polished chrome finished bezel surrounds the gloss white dial, which features black hour markers, minute track and hands. Polished chrome-finished decorative weight shells and grid pendulum adds to the linear appeal of this clock. There's beveled glass on the front as well as plain glass on the sides. Interior of the case is illuminated. The upper back panel is removable, allowing access to the movement and pendulum driver. Quartz, triple chime Harmonic movement plays choice of full Westminster or Ave Maria chimes with strike on the hour with 1/4, 1/2, and 3/4 chimes accordingly; Westminster chime and strike on the hour only; or Bim Bam chime on the hour only, and have volume control and automatic nighttime chime shut-off option. Make your home complete with this beautiful clock. The 611 Grandfather Clock by Howard Miller at Jacksonville Furniture Mart in the Jacksonville, Gainesville, Palm Coast, Fernandina Beach area. Product availability may vary. Contact us for the most current availability on this product. Browse other items in the 611 collection from Jacksonville Furniture Mart in the Jacksonville, Gainesville, Palm Coast, Fernandina Beach area.